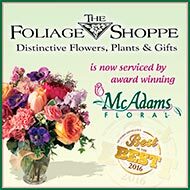 McAdams Floral is the premier flower shop in Victoria, Texas (TX) and was voted Best of the Best florist by readers in The Victoria Advocate 2000 thru 2017 newspaper poll. The Premier Victoria, TX Florist Serving All of Victoria, Texas and Surronding Victoria County. McAdams Floral is a 2nd generation, family owned local florist in Victoria, TX that has been exceeding their customer's expectations since 1975. When you send flowers in Victoria, TX with McAdams Floral, you have the experience of the Best Of The Best flower shop as voted by the readers of The Victoria Advocate newspaper. Whether you desire fabulous flowers, gorgeous roses, lush blooming and foliage plants, or even one of our special gift gourmet baskets; our talented team will create a truly unique design to convey your feelings and deliver a ray of sunshine to the recipient. We also specialize in sympathy expressions and wedding flowers in Victoria TX. McAdams Floral is centrally located in Victoria county to send flowers with our professional floral delivery team to all area businesses, homes, hospitals, and funeral homes in Inez TX, Bloomington TX, Nursery TX, Mission Valley TX, Cuero Texas TX, Edna Texas TX, Port Lavaca Texas TX, Goliad Texas TX. Through our network of affiliated florists, we can also take care of your orders to Corpus Christi Texas TX, and Hallettsville Texas TX, or almost anywhere else in North America and worldwide with a 100% satisfaction guarantee. Read our customer reviews on Yahoo! 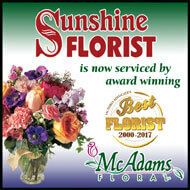 Local to see why other Victorians think McAdams Floral is the best Victoria, Texas Florist.